Last month I was delighted to be asked to help the church to manage and deliver the donations to the Warrington Foodbank. When I first started the job, I had no idea how wonderfully generous the parishioners of St Wilfrids were but in the past few weeks I have been kept busy with an abundance of food and household items to take to those in need and have been proud to see the high esteem in which our Church is held by the volunteers that run the food bank. However understandably there is always sadly a need for more donations from those that are able to give to those that are less fortunate. There are posters up next to the donation box at the back of church and I will be looking to get updates on what is urgently needed in the parish magazine and on the Pre School Praise emails each month. This month the most urgent items required are: rice, sugar, coffee, jam, UHT milk, evaporated/condensed milk, cream crackers/ savoury biscuits, cartons of fruit juice, tinned custard and sponge puddings. Helping the homeless in our town with basic needs and to get back on their feet. We support Homeless Sunday each January and send regular food and clothing donations to these fantastic organisations. There is a box in church to leave warm clothes and blankets. Our annual Toy service provides toys for children in care and in need in our local area. The generosity of our school and church never fails to amaze us. Many people in our church have a collecting box at home for the Children's Society. Each year we have a special Children's Society Sunday where the boxes are brought back to church, blessed and the money counted and sent off to help the work of this Church of England charity which does so much to help disadvantaged and destitute children. 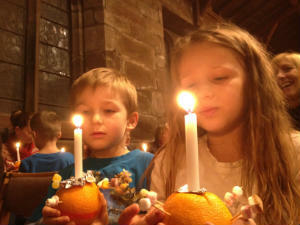 We also hold an annual Christingle Service in December which is very popular and raises lots of money. To join the box scheme please contact us on the email at the top of this page. Members of our congregation undertake the house to house collection for Christian Aid in Grappenhall. This charity support its partners in the developing work to work with local people to deliver the aid they need. The charity reaches people of all faiths and none. In emergency aid situations we will distribute collecting envelopes so that Christian Aid is enabled to send help directly to where it is needed. This amazing charity works tirelessly in the Holy Lands to reach people of all faiths. It has partners who work with disabled children, mothers and babies and with the unemployed to educate and enable them to support themselves through trade and farming. Our Christmas collections support this charity. http://www.samaritans-purse.org.uk/what-we-do/operation-christmas-child/ and to get involved contact us on the email at the top of this page.